Welcome to theTri-Insure Community Fitness Center! 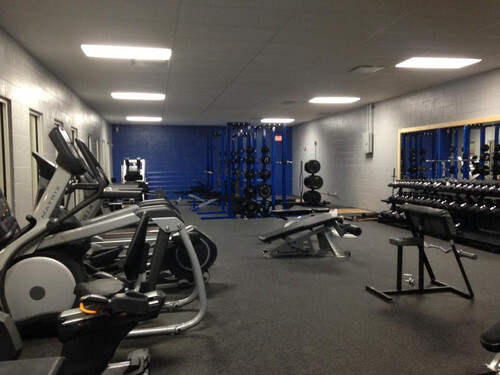 Monticello School's Tri-Insure Community Fitness Center opened in January 2017 thanks to the fundraising efforts of the MHS Sports Booster Club and many generous donors. Our school's fitness center features treadmills, ellipticals, a rowing machine, a stationary bike, a stationary trainer and a variety of weight lifting stations and free weights that can be used by our students, student athletes, staff and community members. The Tri-Insure Community Fitness Center hours during the school year are 6:00-7:30 am and 5:30-7:30 pm and 6:00 am-2:00 pm during the summer. Any community member interested in using this facility is asked to sign a usage agreement and meet with a staff member for a brief orientation. Please stop at the district office or call 608-938-4194 for more information or to set up a tour/orientation. The Monticello Sports Boosters would like to give a special thanks to all who have donated thus far in making our new fitness center become a reality. The following donors have contributed to make this project a reality; Alice & Gene Fahrney, Carolyn Johnsrud, Eldon & Kriss Ace, TRAC Trucking LLC, Lois Hopkins, the Curry Family, Monona Plumbing & Fire Protection, McCutchin-Bittner Family, the Roe Family, Ron & Barb Smith, Dr. Brad Freitag Family, Olivia & Evan Feller, Tanner Mentz, Washington Center 4-H, the Ron & Jen Blumer Family, Larry & Joyce Hummel, Bankers Trust, Dean Health Plan, EMS Insurance, Greenwoods State Bank, Monticello Lions & Lioness, Monticello Community Club, and Tri-Insure.